I have to say that I have really enjoyed this Mystery Challenge and I will look forward to next November when we can start another one. I am truly amazed that I have almost completed a quilt top in less than 2 months during the Thanksgiving and Christmas holidays. Of course I have been a woman with a mission! I wanted to be able to link up to Bonnie’s Easy Street Page http://www.quiltville.blogspot.com/p/easy-street-mystery.html every week so that meant that I had to keep up. That is a pretty good motivator. Plus I couldn’t wait to see and start the next step. Bonnie did a fabulous job keeping us all guessing. It will fit this bed perfectly! I went to a LQS yesterday – http://www.sanfordsewing.com/. 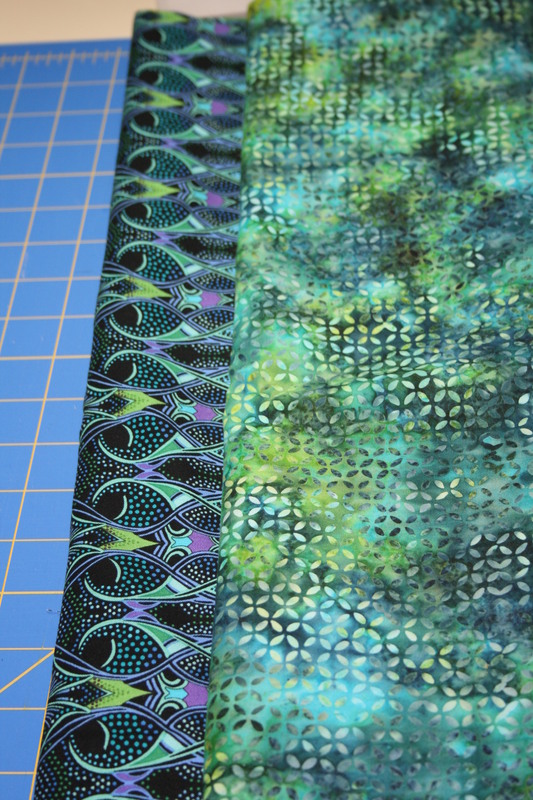 There was a 25% off sale on ALL fabrics so I splurged and bought some for the borders, binding and backing. I didn’t really have any good choices in my stash for the backing – I am still deciding on the borders. These are the fabrics that I bought for the borders. I love them and they may work beautifully but I am still deciding. I will use the fabrics that I bought one way or another because I love them. 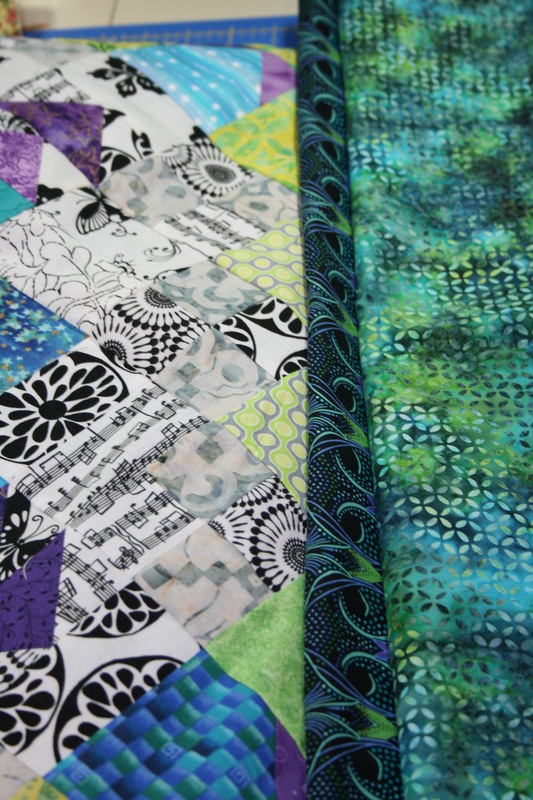 I have found that it is fun to take pictures of the edge of the quilt with different choices of borders. It makes the quilt look so different to see it through the lens of a camera. Thank you Bonnie Hunter http://www.quiltville.blogspot.com/ for sharing all of your wonderful talents, for sharing this fabulous quilt with us all. 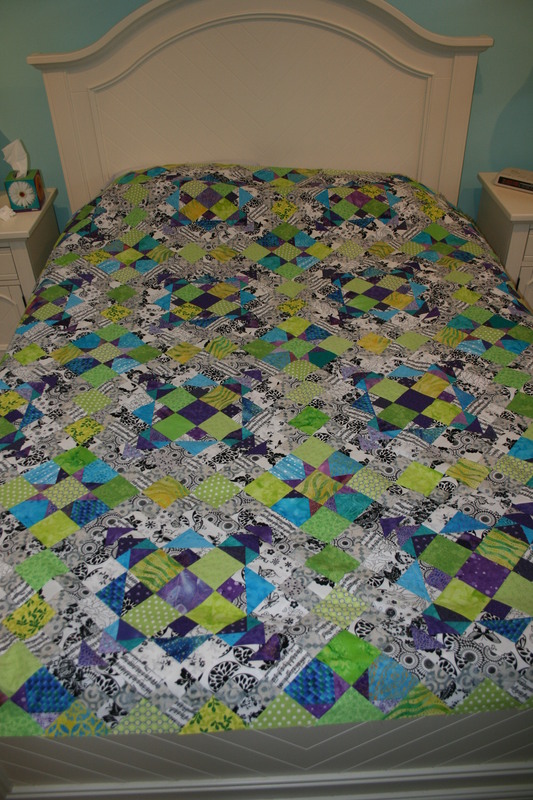 I am definitely going to be making this quilt again with different colors. The stars in this quilt are just screaming at me to be made in Christmas colors, who knows, someone may get it as a present next year. I will be putting the borders on this weekend and bringing it to my longarm quilter next week. I can’t wait to see it completed. This has been a wonderful learning experience for this quilter. Keep pushing your imagination – keep trying new things. I have been quilting for over 30 years and I have never made a quilt that is this “Funky” before. It has stretched my use of colors and taught me several new, quicker techniques. So you can teach this “oldish” dog new tricks. Remember to have fun and sometimes just let it fly! 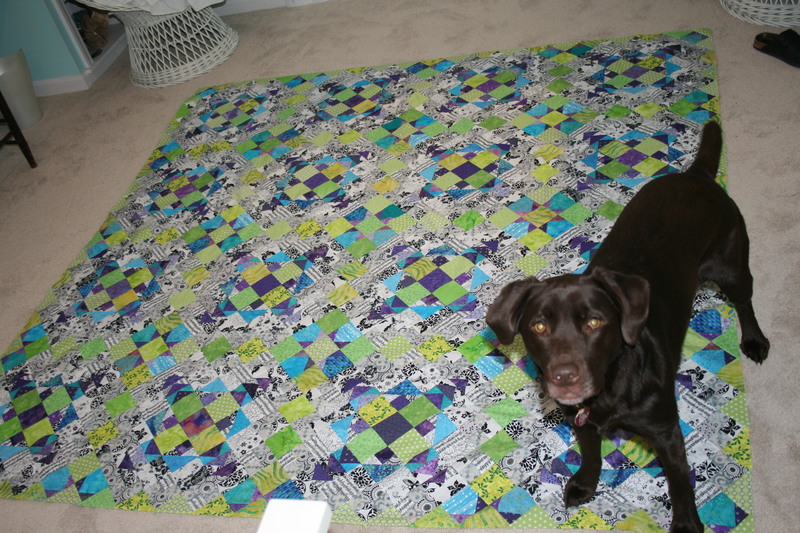 I have seen some of the quilts in Christmas colors on Bonnie’s links and they are wonderful. Makes me wish I had chosen that option. The second time around it should even come together a little easier. Won’t that be nice? it should go together easier but I may not be as excited to get it done as I was this one. Good luck with your quilt. Wow, your border fabrics look great! And what a great find at 25% off. Thanks. Borders should be done tomorrow. Would love to get this to my LA quilter this week. Beautiful…..I have seen most of your quilts Faith and as far as I’m concerned they should all be in frames. I struggle with sewing buttons on so I don’t pretend to know the intricacies of making such beautiful quilts but I do appreciate the beauty of the finished product. Quilt on! Hint- Your sister in law in Florida does NOT have a guilt on her bed…….) Motivational maybe???? ?